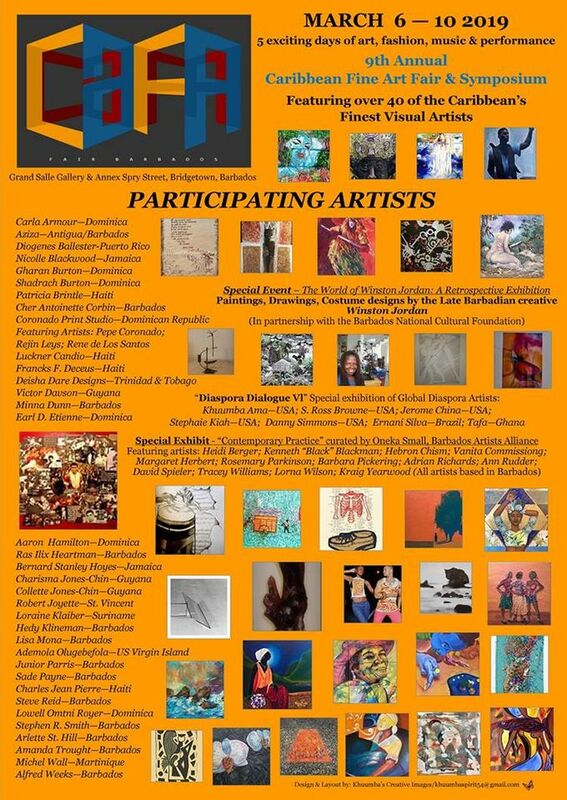 The Caribbean Fine Arts Fair (CaFA) is on at the Grand Salle Gallery & Annex, Tom Adams Financial Center. 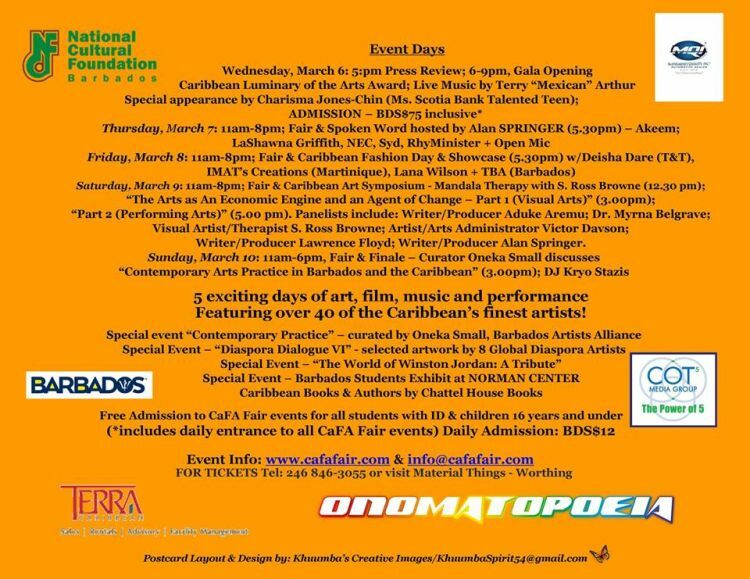 Over 40 of the Caribbean's finest artists will share their work at this year's CaFA. 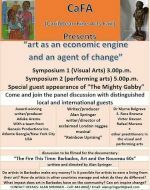 A highlight of the 5-day extravaganza will be a special exhibition entitled Diaspora Dialogue VI, which includes 8 International renowned Diaspora artists representing Africa, Brazil and USA. 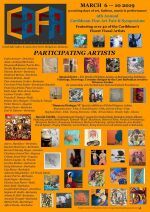 This year, CaFa will be hosting a Special Artists Alliance of Barbados Art Exhibition entitled Contemporary Practice, as well as the Barbados Student Art Exhibition at Norman Centre. 5:30 pm - Spoken Word hosted by Alan Springer. 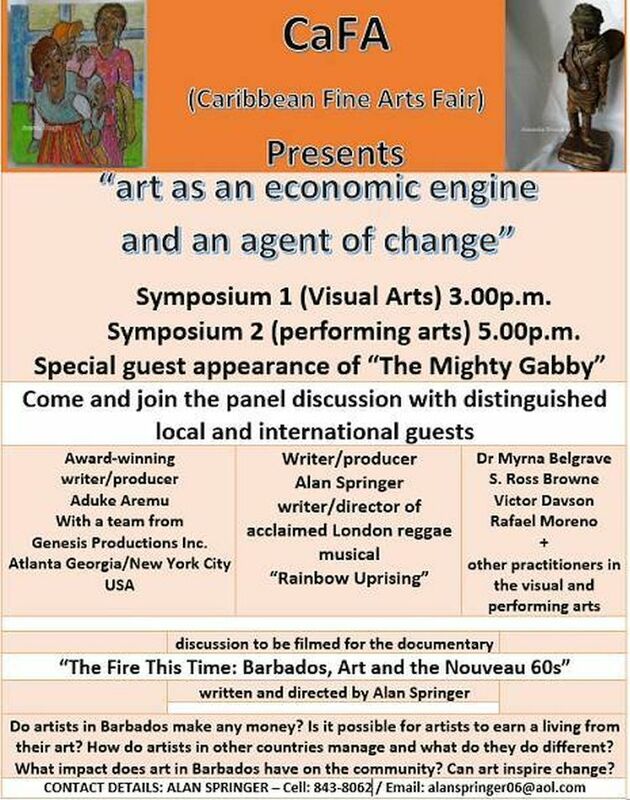 Featuring Cher Antoinette, Khuumba Ama, Loraine Klaiber and Syd. Deisha Dare (T&T), IMAT’s Creations (Martinique), Lana Wilson (Barbados), Andrea L. O’Neale (Barbados), Cherin White (Barbados), Marva Forde (Barbados), Alice Martin (Barbados). Panelists include: Aduke Aremu, Dr. Myrna Belgrave, S. Ross Browne, Victor Davson, The Mighty Gabby, Rafael Moreno and Alan Springer. See 3rd attached flyer for more information. Admission is FREE to to all students with ID & children 16 y.o. and under. Daily admission for adults is Bds $12. For tickets, tel 246 846-3055 or visit Material Things, Worthing.